The Blue Grotto can be found on the south coast of Malta. The Blue Grotto is a series of incredibly formed caves set in the beautiful blue sea. The best way to see the caves at their full natural beauty is to take a boat trip departing from Wied iz-Zurrieg. You can find out more on our Blue Grotto page. These cliffs are especially good to view from sea on a boat trip. But they are also great to experience from the top of the cliff you get excellent views out to the open sea and to Filfla, a small island just off the coast. The cliffs extend quite far around the coastline and act as a natural fort as it would be impossible to approach the island without been seen from the West due to their commanding height. 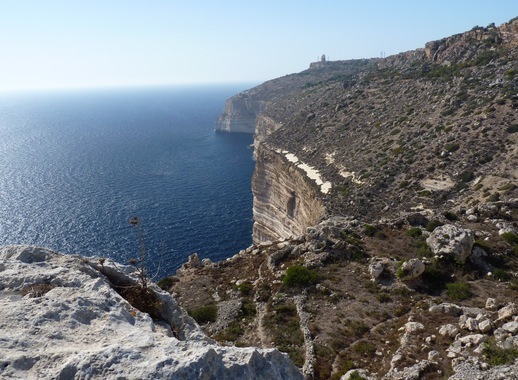 More information is available on our Dingli Cliffs page. Ninu’s cave is an incredible cave that features helictites; delicate cave formations that are rarely seen in tourist caves. There are also an incredible number of stalactite and stalagmite formations. The cave is well lit and set up for tourists and is therefore a great place to visit with a family. You can read more on our Ninu’s Cave page. Calypso cave is located on a cliff in Gozo and looks after the beautiful sandy beach, Ramla Bay. The cave is believed to be the cave featured in ‘The Odyssey’ in which the story tells of how Calypso held Odysseus as a ‘prisoner of love’ for seven years. Find out more on our Calypso Cave page. The Azure window is one of the most photographed natural sites on Malta. It is a natural arch of huge rocks that looks like a table sat over the sea. It was created thousands of years ago as a result of two limestone caves collapsing and is still being affected by the wind and the sea with occasional rocks falling. 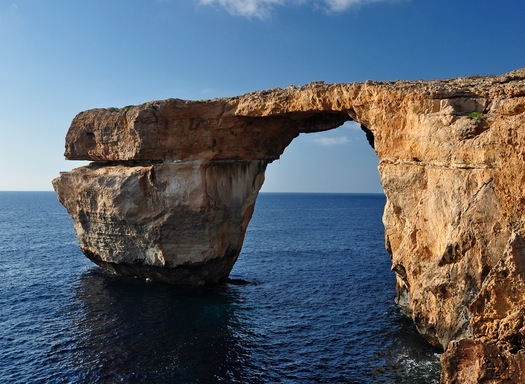 Find out more on our Azure Window page. This natural wonder has provided a refuge on Malta for thousands of years. As well as the cave there is also a museum with some ancient skeletons! Find out more on our Ghar Dalam Cave and Museum page.